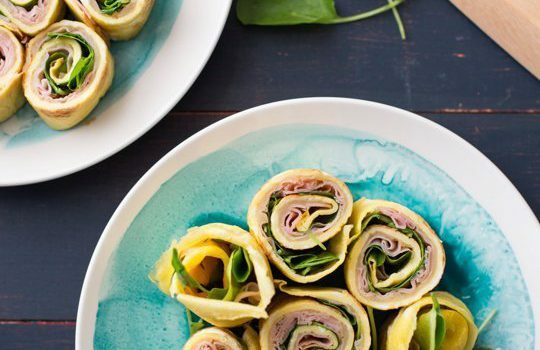 These wraps take the trifecta of breakfast foods, ham, eggs, and cheese, and turn them into portable bites that can work as breakfast, lunch or dinner. Place the eggs, water, flour or cornstarch, and salt in a medium bowl and whisk until broken up and the flour or cornstarch is completely dissolved. Heat 1 teaspoon of the oil in a 12-inch nonstick frying pan over medium heat until shimmering. Swirl the pan to coat the bottom with the oil. Add 1/2 cup of the egg mixture and swirl to coat the bottom of the pan in a thin layer. Cook until the wrap is completely set on the edges and on the bottom (the top can be a little wet, but should be mostly set), 3 to 6 minutes. Using a flat spatula, loosen the edges of the wrap and slide it underneath the wrap, making sure it can slide easily around the pan. Flip the wrap with the spatula. Immediately sprinkle 1/3 cup of the cheese over the wrap and cook until the second side is set, about 1 minute. Slide it onto a work surface or cutting board (the cheese might not be fully melted yet). While still warm, place a single layer of ham over the egg. Place 1/3 cup of the watercress across the center of the wrap. Roll it up tightly. 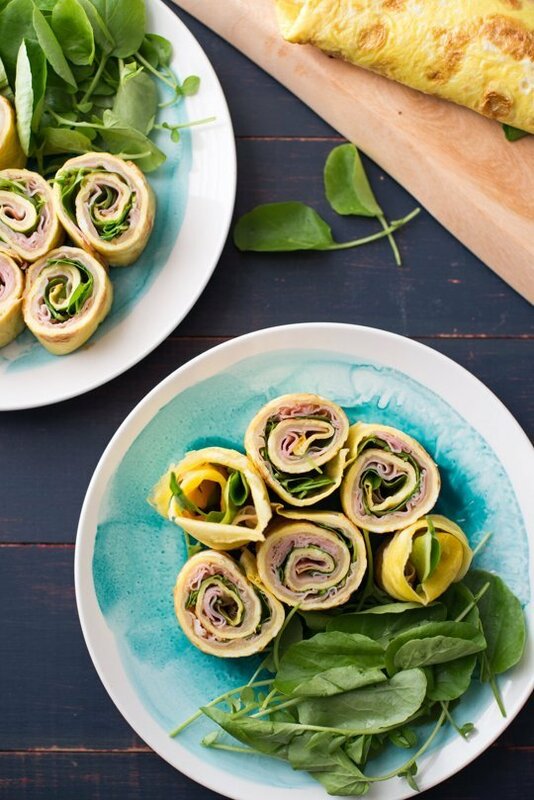 Repeat with cooking and filling the remaining wraps. Using a serrated knife, cut each wrap crosswise into 6 (1-inch) pieces.